The President of the Republic, Mr Danny Faure, attended the official launching ceremony of the Seychelles-Nekton Deep Ocean Expedition 2018-2022 held this morning on board vessel ‘Ocean Zephyr’ at Port Victoria. 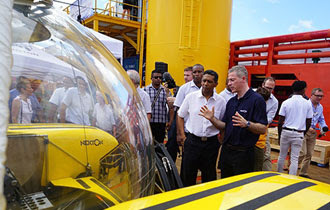 In 2018, the Ministry of Environment, Energy and Climate Change initiated discussions with Nekton Oxford Deep Ocean Research Institute (Nekton), an organisation based in the United Kingdom, to undertake a deep-sea exploration in the Outer Islands of Seychelles. Following numerous national consultations, the expedition was officially launched today. The Seychelles-Nekton Deep Ocean Expedition 2018-2022 is a first for Seychelles, with the exploration of its waters and seabed down to a depth of more than 200 metres around the Farqhuar, Aldabra and Amirantes Groups. Eight local scientists, experts and conservation personnel will participate in the ground-breaking expedition with leading scientists and technicians from the Nekton Team. Speaking after the launching ceremony President Faure said that such an expedition is vital for the country, especially in terms of the collection of valuable data, information and specimens from the ocean. “Seychelles would like to inspire other Governments by taking action to save our oceans. The number one threat to humanity and development is climate change. Here in Seychelles we live in paradise on earth and it is our responsibility to preserve it for our future generations,” said President Faure. Addressing the guests present, Mr de Commarmond thanked the Government for supporting the expedition, NEKTON Deep Ocean Exploration along with its partners, and the Seychelles Conservation and Climate Adaptation Trust (SEYCCAT) for their support in making available a special grant to support the local participants in the expedition. Special mention also went to the Seychelles Tourism Board for their financial contribution and the Island Development Company for supporting project with reduced airfares during the expeditions. The Chief Executive Officer of Nekton and Head of Expedition, Mr Oliver Steed, and the Chief Executive Officer of SEYCCAT, Ms Angelique Pouponneau, also addressed the guests present. This was followed by an introduction of the Seychellois participants on the expedition and a guided tour of the vessel Ocean Zephyr for all invited guests.